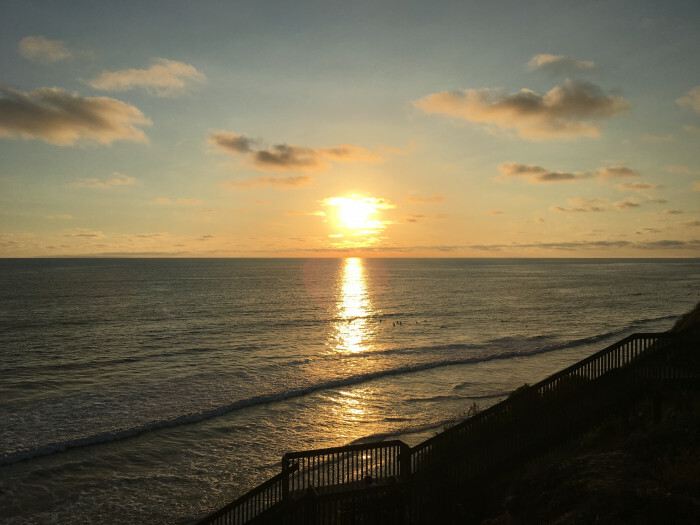 Ask fellow campers about "San Elijo State Beach" and nearby attractions. We were in site 78, no view, hwy 101 was 20' from our back door. The commuter tracks were just on the other side of that and the trains run all night. Our side view was the green construction fence and the construction started very early. If your able to get a site overlooking the ocean it's a beautiful view. We left a day early and will not go back. We camped at San Elijo State Beach in a Travel Trailer. Basically, this review is merely a verification of previous ones. If you get one of the ocean view sites, the view is a "wow". As can be expected in a CA state beach campground in summer, it's packed. Everyone pretty much behaving themselves though. Road/train noise is there but not terrible. Well stocked store. Didn't use food stand. Plenty of food options within walking distance of the campground. We camped at San Elijo State Beach in a Motorhome. Seaside Market is a relatively easy walk across US1. Great market but bring your wallet. Lourdes Mexican Food is in the same general direction and is very good and inexpensive. We were able to get one of the spots directly overlooking the ocean. There is a chain link fence protecting you from falling over the edge of the dunes. You can walk down the nearby steps and stroll on the beach. My only complaint is that the roads are very narrow, and even our 27 foot RV could not avoid going over a curb when we entered the park. Lots of families with young kids here, and plenty of dog walkers too. Everyone seemed to be enjoying the park. There is a small store and a mini-restaurant with great outside seating. They allow fires in the fire pits and the site was very wide, which was nice. We camped at San Elijo State Beach in a Motorhome. Stayed in site 157, site is secluded with bushes on three sides. Park is very quiet and clean unless your in one of the sites next to the street and railroad. Our site was far enough from both that we didn't notice them. Entrance road is a little tight for long RV's, ours is 35', the longest allowed in the park. If not careful you will hit the curb. Roads in the park are plenty wide enough for long RV's. All site parking pads are fairly level asphalt the remainder dirt. Only a few sites have full hook ups, none that a long RV will fit in. There is a double sided dump station with faucets to fill you drink water tank. We didn't use the restrooms, showers, or laundry the four days we were there. Beach access is mostly by stairs, but at the south end of the park you can walk straight to the beach without stairs. The store is well stocked. We like Bull Tacos inside the park, although a little pricey, tacos are good, especially when they have exotic meats. Their breakfast burrito is excellent. We'll be back in the fall. We camped at San Elijo State Beach in a Motorhome. The welcome at the entrance was good. At first we were given a flooded site with a fence between us and the road. The charge for this was $35, for dry camping. We asked for a better site (not flooded), and we settled into a site overlooking the water, on a bluff, with a fence. The charge for this was $50, for dry camping. Each morning we had to check to see if we could stay in our site that night. We had to move once in a three night stay, but that was easy with no hook-ups. The sites were not raked or cleaned between tenants. The sites overlooking the ocean were a good size, but the sites by the road were very small. We were never offered a site with hook-ups, and we did not see any. (Admin note: full hookups are available) The campers were a nice mix of surfers and everyone else. We would not return because we did feel that the value for the price was questionable. 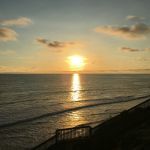 We camped at San Elijo State Beach in a Travel Trailer. Location , location, location . This section of the park was dry camping only as there are ' improvements ' going on supposedly in the sites with services during the off season . An excuse I think to allow the park and staff to rest but , wow , what a waste of state income . Spacious enough sites . Has the commuter train line and Highway 101 running right behind the campground which can be disruptive but not overly so . Watch the sun sink into the Pacific right from your door. Book early for front row . Very popular, especially with the surfing crowd . We would stay here again. 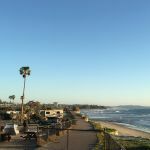 We camped at San Elijo State Beach in a Travel Trailer. We spent a weekend here just to get away. This is an awesome campground. If you can get a site overlooking the bluffs the views are spectacular. There are lots of things to do here. Biking surfing and some great restaurants just up the road. This place is so popular that reservations are backed up usually. If you come early and put your name on a list you might get lucky and get a site if know one shows up but not likely. It is a small campground really so that makes it quaint. Camp here you will love it. We camped at San Elijo State Beach in a Tent. This is popular campground overlooking the Pacific Ocean and fills up fast. There are restaurants and fast food dining near by. The sharp "S" turn to get into the check-in kiosk is tricky. If you are not paying close attention you can rip the roof off the kiosk with your rig. Bull Taco has some excellent cuisine. The convenience market is well stocked. Showers and restrooms are clean; showers require a token that can be purchased at the ranger office. The laundry facility is located next to Bull Taco. The WiFi wasn’t available during our stay. We camped at San Elijo State Beach in a Motorhome. This is a decent State Beach with good vistas, but it is a bit pricey for what you get. The sharp "S" turn to get into the check in kiosk is tricky. If you are not paying close attention you can rip the roof off the kiosk with your rig. We went through with a 36' RV and just barely made the turns. It is also dry camping with a dump station so bring water with you. The dump station is a little tight as well, but doable. For the price I would probably stay at a different beach campground next time. We camped at San Elijo State Beach in a Motorhome. A fabulous place to spend a week. We thoroughly enjoyed or stay here. This campground was our favorite place to stay on a two week, three stop vacation traveling across seven states. The beach is great, surfers out surfing the waves dawn until dusk, sunset was awesome and just a neat clean park. Keep your food stuff picked up and stowed as there are many little ground squirrels running around more than happy to take food off your picnic table. The campground entrance is a bit of a tight squeeze getting in and the camp site was a bit tight getting into but we managed well enough. 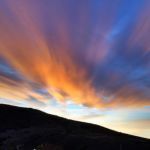 There is a busy highway not more than 20 feet from the east edge of the campground and a commuter train on the other side of the highway that runs about every 30-60 minutes day and night. Neither the highway nor the train was bothersome. We would definitely stay here again. We camped at San Elijo State Beach in a Fifth Wheel. Oceanfront hookup sites are pretty short. Our 29 footer barely fit. No wonder it’s labeled as a 24 foot site. Lots of locals use this place for quick getaways to relax and party. The noise dies down at about 10 PM. Great dog beach at the south end. Bull Taco has excellent food. Good market. This is my wife’s new favorite campground. We camped at San Elijo State Beach in a Travel Trailer. Great location overlooking the ocean. Easy beach access. The only complaint would be with the ants. They invaded out trailer the first night and stayed the whole time. We would stay there again. We camped at San Elijo State Beach in a Travel Trailer. Very spacious sites for a State Beach campground. Some sites had up to 3 RV/Trailers on one site! Stayed in site 93, backs to Coast Hwy but very nice. Definitely prefer the South end of the campground with walk out access to Beach rather than the bluffs of the North end of campground. Dogs permitted on beach "on leash only" south of LG Tower 16. Showers were always hot, token operated, which are purchased at campground office. Only upgrade I would like is to have POWER at every site. Some sites have full hookups but are hard to get. Just to have power would be a great upgrade. Get your chairs and umbrellas on the beach early to secure your spot for the day, can get crowded on weekends. Public crosses through campground for beach access, so can get busy. For SoCal State Beach camping this is one of the best experiences for our family. We camped at San Elijo State Beach in a Travel Trailer. Sites here are very difficult to book. I was lucky enough to secure a beach facing site #21 and we all have a great time at this camp site. This site is right next to the stairs leading down to the beach (the campsites are located on a bluff overlooking the beach) so it's convenient, but you do lose a bit of privacy and the beach/sea view is slightly obstructed by the stairs. The full hookups at this site was a pleasant change to the primitive sites at a lot of the state beaches. The toilets were reasonably clean, but don't expect too much. Sites were spacious and quite well separated with some level of privacy for most. The beach itself affords a very pleasant walk. We were very excited to see wave after wave of pelicans flying in formation right next to the campsites. It was a sight to behold. My guess is that this is a seasonal phenomenon. We will certainly be back. We camped at San Elijo State Beach in a Motorhome. The park is nice with wide sites. Like all CA state parks, the cost is way up ($50 for a bluff site, $65 for hookups). I did not see the camp hosts at all during our stay (3 day weekend). There was a homeless person hanging around the bathrooms for most of the day. There were also homeless people sleeping just behind the inland row which is right next to a busy road. We had our Honda generator stolen while we were asleep - it was locked with a large lock but their bolt cutters were larger. We didn't feels safe and left early. Sadly, we won't be back. We camped at San Elijo State Beach in a Travel Trailer. Are you affiliated with San Elijo State Beach ?